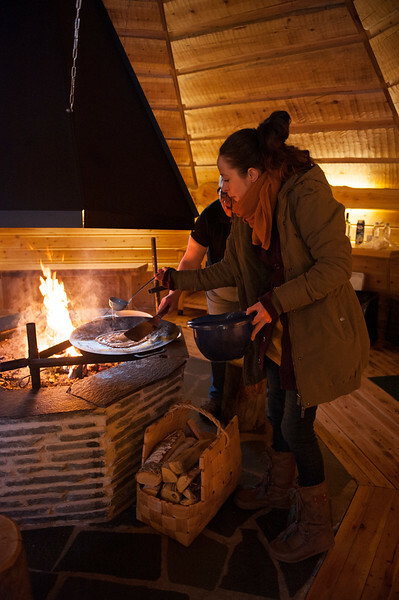 Because of this general dislike of cooking, I’ve never signed up for a cooking course…but that changed when I went to Lapland. While I was perfectly happy with my winter sport-heavy itinerary, I also wanted to delve more into the very interesting Sami culture. Knowing that the food people eat can often provide a glimpse into their culture, I signed up for a ‘Lappish Delicacies’ cooking course, taught by Ritva Aikio, the owner of the restaurant in Inari’s Siida Museum. 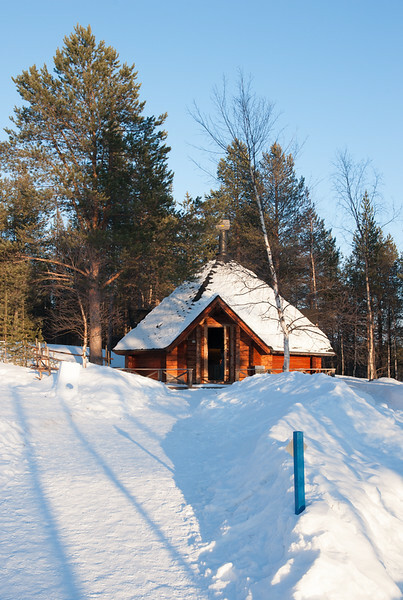 The cabin behind Siida where we cooked our Lappish delicacies. I walked to the little hut behind Siida feeling slightly apprehensive. How complicated was the dish we were going to cook? What exactly constituted a delicacy? Surely I wouldn’t be expected to cook up something like gumppus (similar to Scottish black pudding, except with reindeer blood)? My fears were soon allayed. While we waited for Taru, the other participant that evening, to arrive, Ritva showed me the ingredients for our evening’s menu. Surprisingly, it all seemed within the reach of my basic cooking skills — and that was the idea. 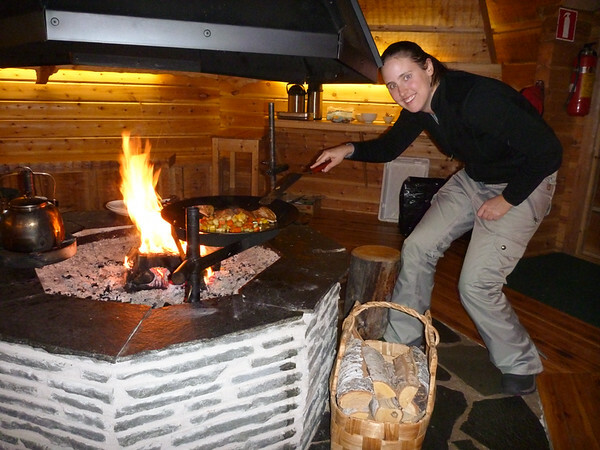 Ritva wanted to show people the beauty of Lappish cooking. It is full of rich, natural flavours; the taste of the meats and vegetables are enhanced by a small amount of seasoning, but nothing more. Ritva showing Taru how to cook a pancake. Our first task was to make Lappish pancakes. They used a similar mixture that I make crêpes from at home, but I definitely don’t usually cook them on a giant iron hotplate over a roaring fire! That inexperience showed when I thought I had enough time to take a picture of it cooking…and ended up burning one side to a crisp. Oops. The next pancake went much better, and I even managed to pick it up and flip it without losing it in the fire (success!). 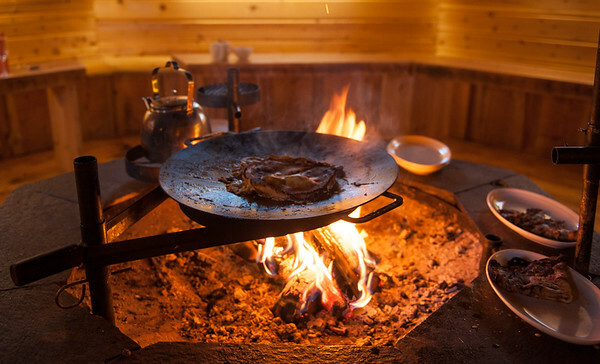 A pancake cooking on the open fire. Our main course hadn’t come very far at all — it was whitefish fresh from Lake Inari just outside Siida’s doors. Having attempted ice fishing on a blustery, snowy day in Norway’s Lyngen Alps, I just had to hope that the fisherman that caught these fish had better weather when he spent all day sitting next to a small hole in the ice. Whitefish has always been a critical staple of the Inari Sami’s diet. In fact, the Inari Sami word for whitefish is the same as the word for fish in general (kyeli). I suppose that’s understandable, since Lake Inari is filled with them. Since it’s the second largest lake in Finland, the whitefish must be especially plentiful! Hard at work cooking our main meal. Along with the whitefish, we grilled fresh root vegetables from the area. We sprinkled all of it with just a light dusting of salt while Ritva told us about how it’s the only seasoning she can use at home because her husband doesn’t like anything else! In the end, we had a hearty meal that Taru and I didn’t burn to a crisp. The combination of natural flavours from the fish and vegetables and the smoky flavour that was added from cooking it over a wood fire was perfect. The pancakes, covered in a sweet cloudberry jam, were a nice, light dessert. It didn’t matter to me that I didn’t learn any complex cooking techniques. I probably wouldn’t have been able to replicate those again, whereas this was a simple but delicious meal I could easily try again at home (albeit with slightly less fresh Lappish ingredients). Ritva works on the same principal when cooking for Sarrit, her restaurant in Siida, as she did during the class. She uses only local ingredients and lets them speak for themselves in savoury (and very more-ish) meals. Just before we dug in to our dinner. Her lunch buffet was exactly what I needed after tramping around in the forest surrounding the River Juutua and often finding myself knee-deep in snowdrifts as I tried to take photos. 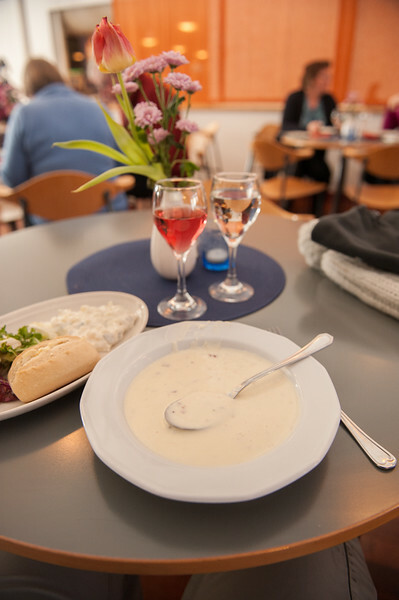 I had not one, but two steaming bowls of creamy reindeer soup (with, of course, plenty of hot bread to dip in it). This was complemented by a tasty juice drink and a bowl of syrupy Arctic berries (I loved their slightly bitter, fruity taste and I miss not being able to eat them daily now!). For dessert, I could have had any number of freshly-baked treats, but by that point I was so full of reindeer soup and berries that I couldn’t fit anything else in. Creamy reindeer soup at Restaurant Sarrit. I am very grateful to Ritva for giving me such a great introduction to Lappish cuisine. 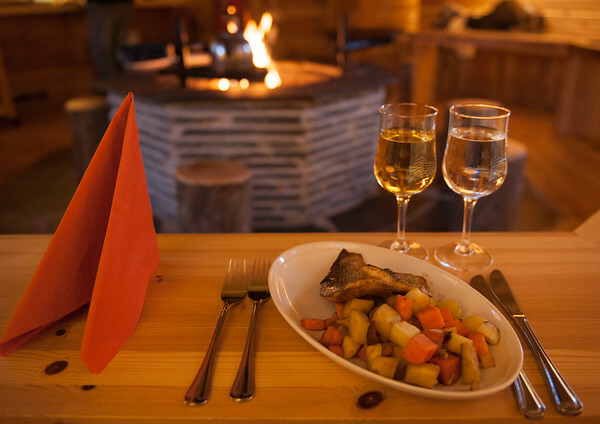 Although I would have still picked local options off all my menus in Finland, her insight into Lappish food helped me to appreciate it all the more. Plus, the class gave me a bit more confidence in my own cooking ability, so I might even be inspired to try another one sometime! What sort of challenges have you taken on in your travels? Were they easier or harder than you expected? I cooked with Ritva as a guest of InariEvent, but all opinions here are my own. 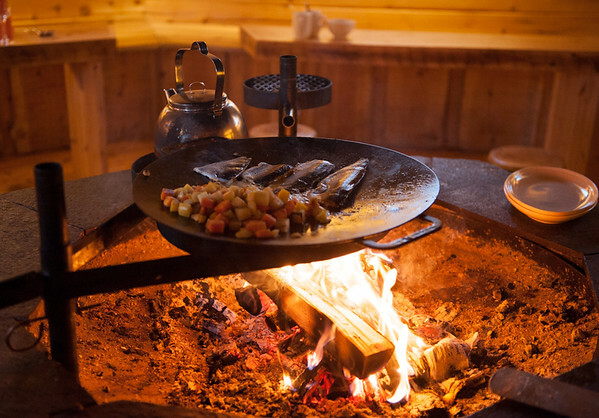 InariEvent offer the Lappish Delicacies cooking courseevery Wednesday from mid-June to the end of April. It runs for three hours and costs €140. The buffet lunch at Restaurant Sarrit runs from 11am to 3pm and costs around €12.